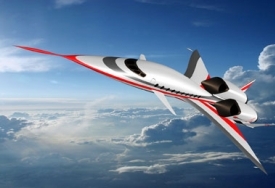 HyperMach Aerospace announced a new configuration for its SonicStar supersonic business jet (SSBJ) that it claims will boost the aircraft’s top speed by about 12 percent to Mach 4.5, while increasing range by 500 nm, to 6,500 nm. At its planned high-Mach cruise speed of Mach 4.4 at FL620, the SonicStar would be able to fly from New York to Dubai in only two hours and eight minutes. HyperMach has reconfigured the design of its proposed supersonic business jet, SonicStar, with a larger fuselage, new swooped delta wing and redesigned V tail. It has also boosted the output of the aircraft’s in-development H-Magjet 4400 engine to increase the top speed to Mach 4.5. The updated version–which includes a new swooped delta wing, redesigned V tail and a pair of more powerful engines–is “slightly larger” than when the SonicStar was first announced at the Paris Airshow last year. Thus, it could now accommodate up to 32 passengers, instead of the original 20. Work is now said to be under way on the SSBJ’s 65,000-pound-thrust H-Magjet 4400 “hybrid turbofan ramjet” engines, which are being developed by Portland, Maine-based sister company SonicBlue. The company says it plans to start engine rig testing next year, followed by core and then electrical compressor tests in subsequent years. A full engine run is scheduled for 2018. The redesign has pushed estimated first flight one year to the right, to 2022, but HyperMach says it still expects certification and entry into service in 2025. The company will start taking orders for the $180 million SonicStar next month.